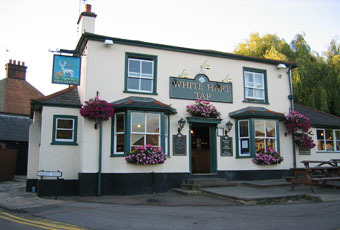 Our last pub of the day in St Albans was the White Hart Tap. It was much better than I remembered it from my last visit over 7 years ago. I remember it being packed on that autumn Saturday evening. But it was much more pleasant on this winter Saturday afternoon. The barmaid and customers were friendly. Families were present. The ale range was Castle Rock Harvest Pale, Tring Side Pocket For A Toad, Timothy Taylor Landlord, Sharp's Doom Bar, Staggeringly Good Stagger Saurus IPA, Mad Squirrel Roadkill & Howling Hops Pale. Ciders were Aspall's Temple Moon, Weston's Flat Tyre & Friel's Traditional Cider. I'm increasing my score from 5 to 7/10. Return visit to try the food and wasn't disappointed. Also had one of their own beers(session brown ale) available which was very nice. Really nice pub with a good range of ales with an emphasis on IPAs. Unfortunately no dark beers on my visit. They apparently have an in-house brewery but there was no sign of it's produce. Didn't try the food but it looked very good. Extremely friendly cat. Will certainly return in the near future. Refurbished back street local with an excellent range of real ales. Well-heeled and slightly boho clientele. A few too many dogs for my liking. But this was a good pub and well worth the visit. Occasionally over-tolerant of noisy babies (or, to be fair, of "enlightened" parents who choose to impose their squalling infants upon our intolerant ears). Otherwise, much improved these days. Ale range varied and interesting and always in good nick. Former unpleasant elements among staff now gone.